Here. Forward. : What's wrong with these pants? When it comes to my children and clothing I choose not to fight. I don't really care what they wear as long as they are dressed when they leave the house. They do have a few church outfits which I have asked them not to wear when they play. I will make suggestions when it comes to clothing but I decided a long time ago not to argue. P who is 5 has always had a style of her own. Last summer she wore the same jeans and shirt all summer long. We bought her new jeans which she wore every day for 3 months until she burned a hole in the knee. I turned them into cut offs and bought her a new pair which she continues to wear. Now that the weather is warmer, her clothes stink after one day. I have refused to let her wear stinky clothes and have asked her to find something else until I do the laundry. 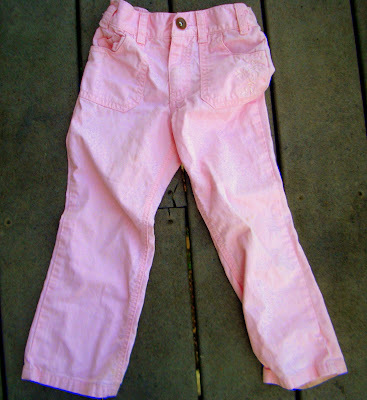 Everyday I have laid out these cute pink jeans and every morning she tells me, "throw them away I don't like pink jeans." After tears of "I don't know what to wear" she finally came downstairs with this. I don't know why this was so funny to me this morning because she always layers her clothes. This really isn't a new look for her. I think what struck me was the combination of colors which don't show up very well in this photo. Her black "funeral pants", brown shoes, and a wool skirt...For me personally, I would have worn the pink jeans with the pink top.